MAKE YOUR NEXT VOLUNTEER TRIP COUNT BY JOINING ONE OF OUR PROGRAMS AND BECOME PART OF A WORTHWHILE CAUSE IN SOUTH AFRICA TODAY! South Africa, officially the Republic of South Africa (RSA), is the southernmost country in Africa. It is composed of 2,798 kilometers (1,739 mi) of coastline stretching along the South Atlantic and Indian Oceans. South Africa neighbors are Namibia, Botswana, Zimbabwe, Mozambique and Swaziland. South Africa is the largest country in Southern Africa and the population is close to 56 million people. It is the southernmost country of the Eastern Hemisphere. About 80 percent of South Africans are of Sub-Saharan African ancestry. There is nine official ethnic groups speaking different African languages which have official status. The remaining population consists of Africa's largest communities of European (white), Southeast Asian and Multiracial (colored) ancestry. South Africa is a very diverse ethnic community composing of an extensive variety of cultures, languages, and religions. There exists 11 official languages, which is quite impressive and is among the highest number of any country in the world. One of the main languages used are of European origin: Afrikaans which was originally developed from the Dutch serves and is the primary language of most of the white and colored South Africans. English is used in public and commercial life, but is not the most common language spoken. South Africa is a nation of approximately 47 million people of diverse origins, cultures, languages, and religions. It is a country that has gone through numerous struggles in the past century, and faces more in the future. The spread of AIDS is an alarming problem in South Africa with up to 31% of pregnant women found to be HIV infected in 2005 and the infection rate among adults is estimated at 20%. Malaria is also a growing issue in South Africa. Unemployment rate also pose major problems, as 1/4 of the population remains unemployed, living on less than $1.25 USD/day. Another major problem in South Africa is poaching. When this horrible act is carried out, it leaves both the wildlife and marine life on the brink of extinction. Off the coast of South Africa, Sharks are being killed for their fins faster than they have time to fully mature and reproduce. As it stands, there is now less than 10% of the original population in our oceans. Due to high amounts of poaching, lack of laws, and low levels of enforcement; the animals and marine life of Africa and our world is diminishing at a rapid rate. If pressure is not put on governments to change ways, educate locals, and enforce laws, we may lose our precious wildlife in the very near future. 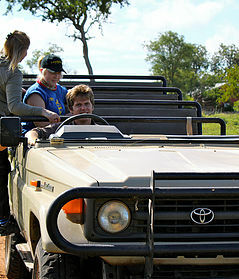 While volunteering in South Africa, the programs we offer allow volunteers unique experiences to educate themselves on these issues, get involved in the local community and learn more about the African culture and the way of life. If you have the courage and desire to make a difference in South Africa, you will be rewarded immensely as it is one of the most exciting countries to volunteer in; especially if you have a big heart for Marine or Wildlife. WEATHER AND CLIMATE: South Africa is situated in a subtropical location. The weather is moderated by the Atlantic and Indian Ocean. Across most of the country, the summer season is between the months of December to February. It is characterized by hot, sunny weather with temperatures averaging around 25 °C / 77 °F. The winter season is between the months of May to September. During these months, the weather is cooler and drier with evening temperatures averaging around 10 °C / 50 °F. Before you can observe animals in the wild, they must be located. To become an expert animal tracker, it takes years of practice and expertise. 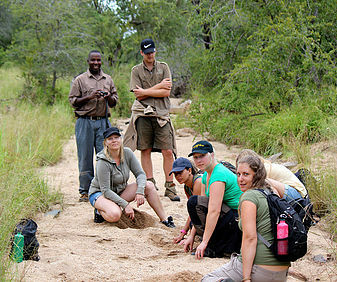 A professional Guide (animal tracker) often uses a combination of several different techniques to be able to do so. To see the majestic animals of Africa, there are many ways to doing this but what a lot of outsiders believe is that the best way to spot them is to simply drive around an area and hope a bit of luck will bring you to the animals. 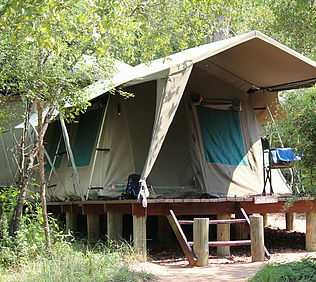 It doesn't take very long in a wildlife game reserve to realize this is not the best way. Gaining valuable knowledge of a particular species and being able to understand how to track particular animals by using footprints to determine their whereabouts is one thing that a good Guide must eventually master. This is no easy task but lucky for us, it can be learned. Another viable technique of locating wildlife is by using Telemetry. This can only be performed if a particular animal has been tagged and with a radio collar. With a little practice and a lot of hard work, one can master the technique of using radio waves and frequency, to be able to locate their whereabouts and marvel at their beauty. We monitor and record locations, demographic composition and any significant behavioral displays of the wildlife on the reserve such as elephants, lions, impalas, giraffe, hippopotamus, zebras, buffalo and wildebeests. This helps to determine trends in habitat utilization as well as helping to correlate animal population sizes with counts conducted every other year. Monitoring drives are conducted everyday in the mornings and afternoons. Each week a schedule is posted which indicstes which specific animal will be monitored. During the drive, volunteers are briefed on the importance of monitoring, what to look for, and are always encouraged to participate in surveying the smaller mammals and birds seen on each drive. During the drive, data is collected pertaining to animal movement patterns, reproductive behavior, grouping and association patterns, and predator/prey interaction of all big game animals on a daily basis. The data collected is also used for long-term analysis. Identification kits have already been produced so that these animals can be easily recognized and their behavior patterns can be observed over an extended period of time. The research and data collected during monitoring helps to assist in the decision making processes and challenges associated with management of enclosed game reserves. With the data that volunteers help to collect, we hope to eventually create a management model which can be applied to other conservation areas, in order to prove there is indeed a future for long term private conservation development. You will have the opportunity to get involved in a number of community projects close to the Game Reserve namely the Holy Family Orphanage and St Martin's Community Creche. These projects are often provided with basic support and volunteers are encourage to purchase food, toys, stationary and other things these children may desperately need. Volunteer will visit these projects every two to three weeks. Most of the children just enjoy the attention they get and it is a wonderful feeling to be able to bring a smile to their faces at the mere sight of you. If Marine Conservation interests you, then you will be given an out of this world opportunity to jump into the open ocean with the almighty Great White Shark, in a cage of course. The Great White Sharks are one of the most deeply understood and misrepresented animals on our planet. The shark fin trade is wiping out the population at an extremely high rate. If we don't do something fast to stop this barbaric brutality, we will lose one of the most precious fish that inhabit our oceans. There is no question at this point that this will leave a devastating impact on the remainder of our ecosystem. South Africa has long been known for its abundance of great white sharks. These majestic predators have been terribly misrepresented and has attracted massive negative media publicity over the years, because of this; sharks have become one of the most maligned, misunderstood, even hated species on our fragile planet. They have been pursued, hunted and indiscriminately slaughtered, to the point where many species are endangered. Unsustainable fishing practices, dorsal fin poaching, and environmental degradation compounded by a relatively slow great white breeding cycle are all factors contributing to the potential demise of this amazing creature. * PLEASE NOTE: The starting dates for this particular program are on the 1st or 15th of each month. ~ Chumming, bait, food etc. Program Fee – project orientation, program supervision, accommodation (private or dormitory style) and meals during volunteer program period, in-country 24/7 volunteer support and in country administration costs. Airport pickup/transfer is NOT included in the program fee but private transport is available for either program.